I have little storage space in my small townhouse, and none in my kitchen for food I've "put up," to use a very old phrase. 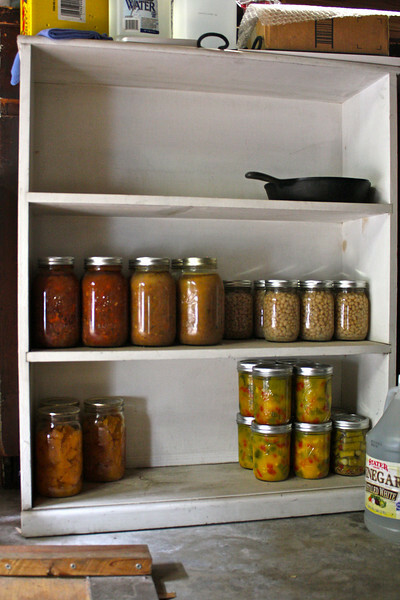 I started with the pumpkin in November, but by the time I got to the next batch (which was my first try at pickled asparagus), I cleared out this old bookcase I have in the garage. It will have to do for now. Come summer, I'll probably want to move them all indoors as it gets pretty hot in the garage. But where!? The dates photos were taken are underneath each shot. I want to devise some protective cover for the front just in case... of an earthquake or whatever.